With Grandmaster Lun Guy at his home in Fat Shan. Grandmaster Lun Guy is the most senior student of the late Great Grandmaster Ip Man who is still teaching Wing Chun in Fat Shan. He was one of the first five students that Ip Man taught before Ip Man moved to Hong Kong to open up the knowledge of Wing Chun to the world. The rest is history. At this meeting he was kind enough to let me interview him and showed me the Wing Chun that Ip Man taught him in those early days. He demonstrated some of the variations between the Fat Shan version and the Hong Kong version. When I visit Hong Kong I always like to pay my respect to Grandmaster Ip Ching and Madam Ip to have a cup of tea with them and to take in some advice on Wing Chun. Ip Ching now lives in the flat where Ip Man used to live and taught his students. Being in Ip Man's house was enough to give anyone goose pimples and be invigorated with new inspiration, especially with him looking down from his portrait on the wall. Training with Ip Man's old dummy and his Bart Jarm Doe (double cutlass)-now in the Wing Chun Museum in Fat Shan-is a great honour. Taking lesson in Chee Sau from Grandmaster Ip Chun at the Ving Tsun Athletic Association, Hong Kong, which is the headquarter of the international Ip Man Wing Chun. The Association is opened to all members for training and information on all aspects of Wing Chun pertaining to the Ip Man lineage. 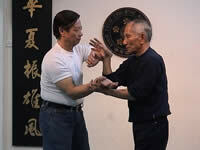 Grandmaster Ip Chun's wealth of knowledge on Chee Sau is reknown and he is an excellent teacher. It is a priviledge to be taught by such a master of excellence. Master Kwok is my teacher. He actively teaches Wing Chun in England and gives seminars regularly in USA, Europe and Africa. He is very dedicated to the teaching of Wing Chun in the traditional form in order to preserve the purity of the roots so that the art is not lost with the advance of time. 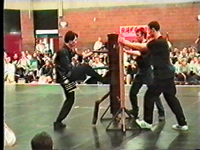 Here he demonstrates the Muk Yun Jong (wooden dummy) where the most effective techniques of Wing Chun are embodied in its teaching.